GET YOUR SCHOOL READY TO PARTICIPATE…STAY TUNED! 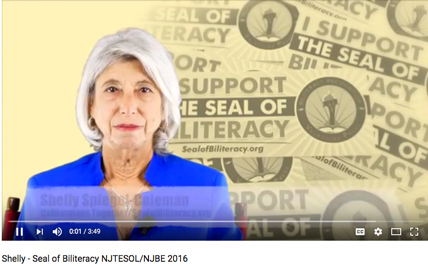 The New Jersey Department of Education is in the process of developing criteria to designate students as biliterate and expects to implement the criteria for the 2016-17 school year. Students who participate in the biliteracy initiative will have the opportunity to meet the criteria in English and in world language(s). In the interim, please direct questions to the Bilingual/ESL Bureau in the Office of Supplemental Educational Programs at lep@doe.state.nj.us or to the World Languages Coordinator in the Division of Teaching and Learning at worldlang@doe.state.nj.us. Please click image to watch on YouTube.